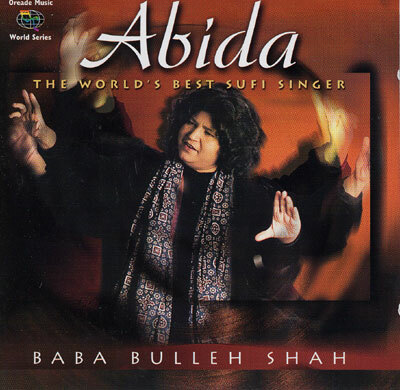 Abida "Baba Bulleh Shah": One of the leading Sufi singers of today, Abida Parveen carries on the legacy of Nusrat Fateh Ali Khan. This is in the style of what is called Qawaali, the ecstatic singing of the Sufis in an improvisational style. With full accompaniment from harmonium, three tabla players, Sarangi, mandolin, bass guitar, Tanpoura, additional percussion and keyboards, this recording is likely to lift off at any time with virtually no warning. As the Queen of Sufi mystical singing, her singing is an exquisite adventure into the music, the lyrics, themes, melody, improvisation, arrangements at al, all passed down from older generations that hint at secrets from the beginning of time. Many of the pieces are from the 17th century poet/mystic/saint Baba Bulleh Shah, and his words translate through Abida into intense mystical dialogues, fiery and focused.